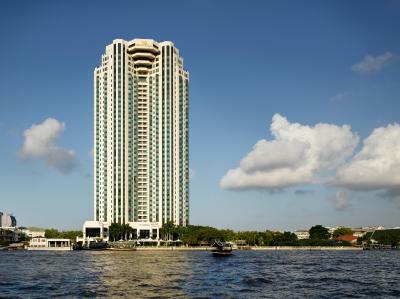 Lock in a great price for The Peninsula Bangkok – rated 9.3 by recent guests! Location was great, by the river and next to the big new shopping mall, Iconsiam with frequent shuttle boats. Staff are really really nice, all smilies. The breakfast buffet is good, albeit a bit limited in choice. The dinner at the Thai restaurant, Thiptara is great. Be sure to order the chicken in pandanus leaves. 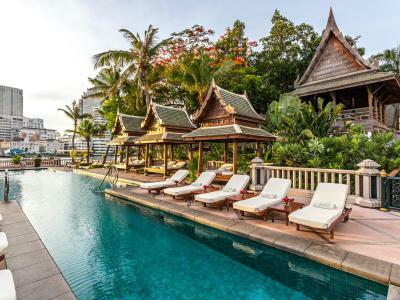 A lot of complimentary activities are offered, like yoga and Thai boxing lessons. All in all, a great hotel. Spacious and exceptionally clean room, superior service and friendly staff. We even got a free upgrade to the balcony room and complimentary dessert for our honeymoon trip! Was upgraded to a suite. Fabulous room. Awesome breakfast. It is in a class all of its own...it shows pride and customer care.. a rare mix of late.. Look forward to return next year.. Attention to the little things, herb garden, location, attentive and friendly staff and balcony. Amazing stay! I had a nice spacious apartment with living room an sleeping room, with excellent view. A nice addition was a display showing external temperature and humidity. The room was spacious and had beautiful river views. 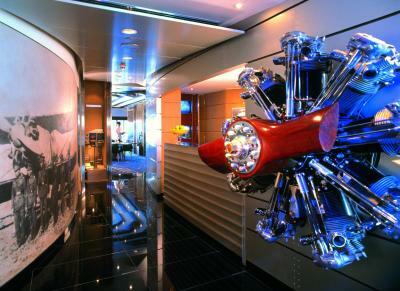 The hotel offers a ferry taxi service that is convenient and fun to experience. The whole experience is exquisite from arrival to leaving. The attention to detail is staggering and nothing is left to chance. The room layout is perfect with a fantastic balcony. The in room facilities including the TV in the bath, essential after a workout with a beer, are great. The afternoon tea looking over the river was something to remember. 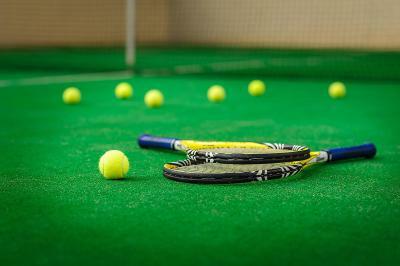 The pool and fitness facilities are outstanding in quality and service. The river taxi going back and forth just finishes it off. 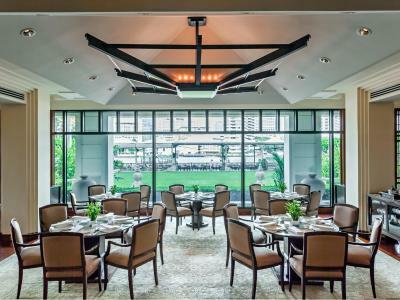 The Peninsula Bangkok This rating is a reflection of how the property compares to the industry standard when it comes to price, facilities and services available. It's based on a self-evaluation by the property. Use this rating to help choose your stay! 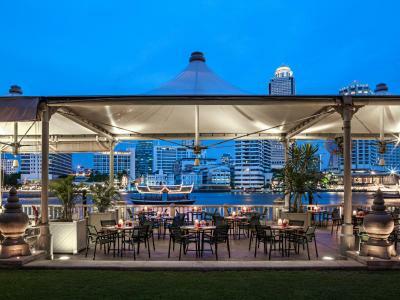 Right on the Chao Phraya River, The Peninsula Bangkok features luxury guest rooms with full facilities and views of the Chao Phraya River. This disabled-friendly hotel includes an outdoor pool and a fitness center. Free Wi-Fi is available in the entire residence. 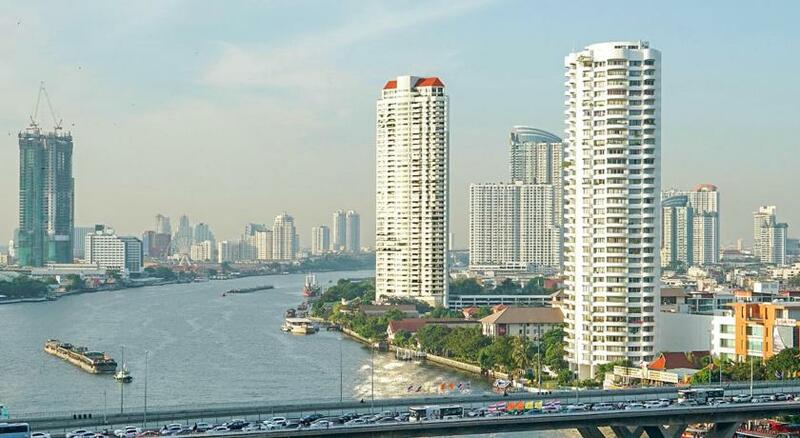 It is just 5 minutes by free ferry transportation from Saphan Taksin BTS Station. 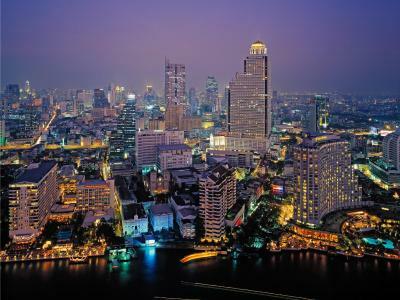 Suvarnabhumi International Airport is a 45 minute drive from The Peninsula. 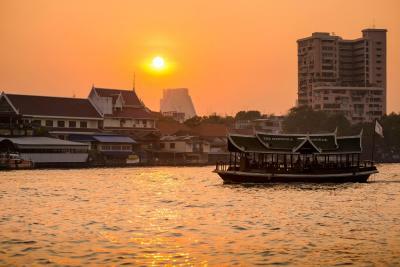 Grand Palace and Wat Arun Temple are within a 20 minute drive of the property. Rooms include a walk-in closet, a sofa and a sitting area. Other facilities include electronic curtain control, mood lighting and a cable/satellite flat-screen TV. Private bathrooms have free toiletries, a bathtub and shower facilities. A daily fruit basket is provided in the rooms. Guests can enjoy hotel’s facilities such as spa, sauna and business center. Currency exchange, car rental and laundry services are available. There is a tour desk and a ticket counter to help guests with sightseeing arrangements. 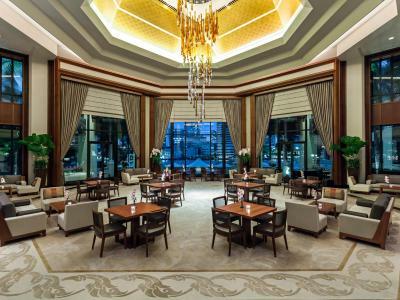 Dining options include The Lobby which serves breakfast, lunch and dinner. Enjoy fine Cantonese cuisine for lunch and dinner in stylish setting at Mei Jiang Restaurant. 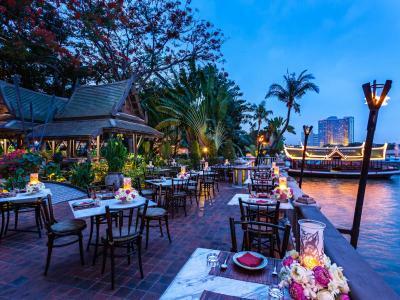 Thiptara Restaurant features authentic Thai dishes for dinner in an ancient Thai style decoration with river views. 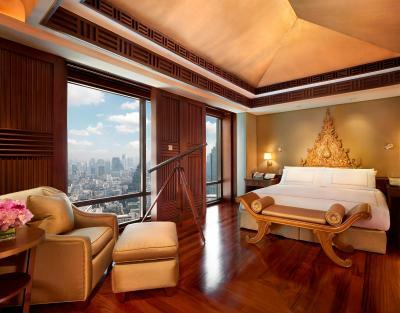 When would you like to stay at The Peninsula Bangkok? Room features a cable/satellite flat screen TV, a sofa and a sitting area. Private bathroom includes a bathtub, a hairdryer and shower facilities. Guests enjoy river views from this room. Luxurious room includes a cable/satellite flat screen TV, a sofa and a sitting area. The private bathroom features a bathtub, a hairdryer and shower facilities. Guests can enjoy river views from this room. Spacious room features a private balcony with river views. It includes a cable/satellite flat screen TV, a sofa and a sitting area. The private bathroom features a bathtub, a hairdryer and shower facilities. Spacious Suite includes a living room with a sofa set and a dining area. The private bathroom features a bathtub, a hairdryer and shower facilities. Guests can enjoy river views from this room. On the higher floor, this spacious suite includes a living room with a sofa set and a dining area. The private bathroom features a bathtub, a hairdryer and shower facilities. Guests can enjoy river views from this room. This twin room features a seating area, mini-bar and bathrobe. This suite features air conditioning, mini-bar and bathrobe. This suite has a sofa, CD player and bathrobe. This twin room features a flat-screen TV, mini-bar and bathrobe. This twin room features a sofa, seating area and DVD player. This suite has air conditioning, mini-bar and seating area. This suite features a satellite TV, air conditioning and CD player. 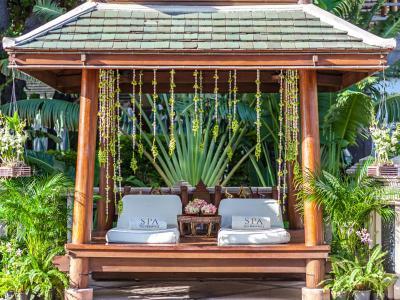 House Rules The Peninsula Bangkok takes special requests – add in the next step! The Peninsula Bangkok accepts these cards and reserves the right to temporarily hold an amount prior to arrival. Some of the staff at the swimming pool spoke very little English. I once asked for a dish "to share" which as he did not understand what I meant, ended up not putting the order in. Another time I had to point the dish on the menu even though I was saying it in English - it was mango sticky rice so it shouldn't have been such a struggle for me to be understood. Perhaps some further training or English classes should be provided to the most junior pool staff. The location of the hotel is incredible. On the river and the hotel provides boat rides whenever you want. There isn't a schedule you need to adhere to. Staff is generally professional and accommodating. The hotel facilities are well taken care of and the hotel has various restaurants that you can enjoy. 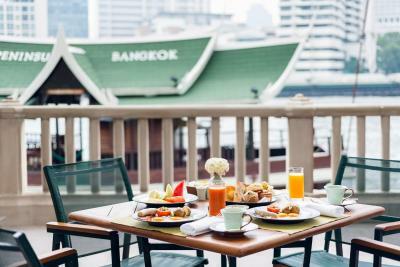 We recommend the Thai which is outdoors and on the river. If you manage to catch the front tables then you have an incredible view while having dinner. The buffet restaurant food also looked amazing! The swimming pool is very relaxing and also overlooks the river. In addition they have a separate area where no noise is allowed, keeping children just to one side of the pool. We saw a pool staff member come over to quieten down some noisy children on the quiet area of the pool once which was much appreciated. The room we stayed in was clean and with an amazing view. Robes and slippers (really good ones!) were provided but for a hotel like this we expected amenities such as toothpaste to be provided as well. An iron was also missing from the room which we could have used. The room however was spacious, clean and comfortable. Driver of the bmw we hired for the day should have thought of the comfort of the passengers. Instead of dropping us at the nearest point to the palace, he parked first and made us walk in the heat to the palace. Pool gets crowded sometimes, gym a bit small and windowless. 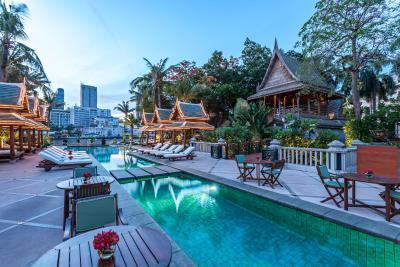 Phenomenal hotel, great staff, beautiful pool, well located near new ICON SIAM mall. The ferry across the river is important for connecting you to Bangkok, but, just occasionally, could be more efficient. Superbly appointed comfortable suite - more like a home than a hotel. Superb river view. Nice pool complex. Breakfast choice and quality very good. Big enough to feel grand, but not barn-like or touristy - relaxed, but classy. Helpful, smiling staff, able to understand English accurately, and with quite well judged service level - there, but not over attentive, or familiar. The equipment in room is limited, with no coffee machine and no speakers for music. The gym is a bit on the small side . I didn’t find any lockers by the pool so I guess you would have to go to the pool in your swim wear. It is a lot of trouble since guests are supposed to always dress up in the hotel. Great views from corner room on 29th floor. Corporate management trainee Sebastian Ramseier made sure we had a very enjoyable riverside breakfast each morning. Gracious staff. Everything was great. 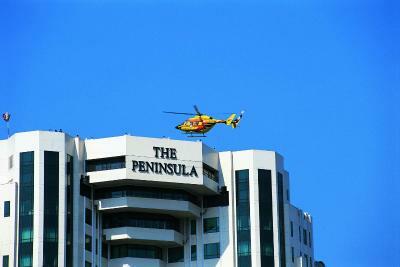 We look forward to our next stay at the Peninsula Hotel. 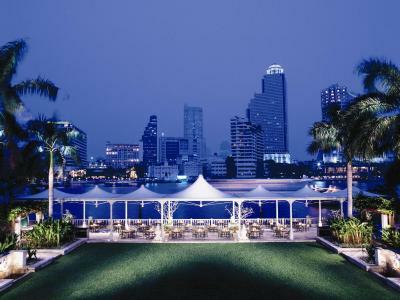 The Peninsula Bangkok is an amazing hotel full of excellent service and super lovely and super friendly staff. The all make your stay to a wonderful time. The pool area is also very recommendable. It has an amazing view and the service there is perfect, too. You are regularly surprised with little snacks or little refreshing drinks.